A truncated weekend, due in part to Allison being under the weather and also - um - the weather. 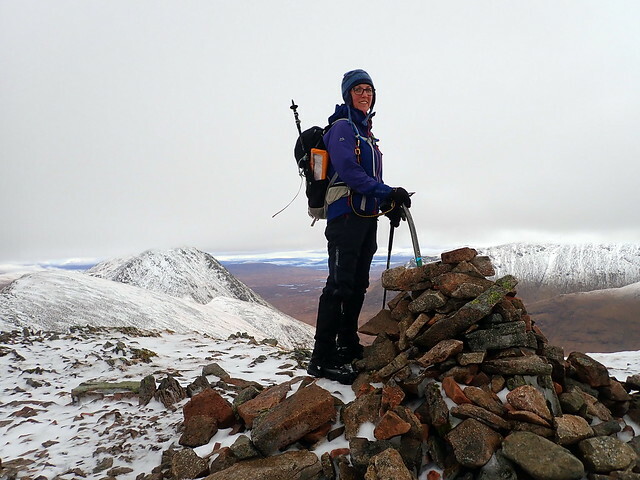 When we were out last weekend on the Ring of Steall and the Grey Corries, Allison was complaining of headache, nausea and fatigue. This worsened by the start of the week to include photophobia and neck stiffness; she really wasn't very well at all. It seemed unlikely that we'd get away together this weekend and I started thinking about routes to do alone. The stormy weather on Thursday night/Friday didn't help with planning much - I'd drawn a route to include the Beinn a'Chlachair Munros along with Binnien Shuas and Shios and some Simms, but every time I went out on Friday to put kit in the car another sheet of rain swept down and diminished my determination. I contacted Allison who said she was feeling a bit better, still had some residual symptoms. So we decided that she'd probably benefit from a gentle couple of days on the hill, more than yet another day confined to the house. 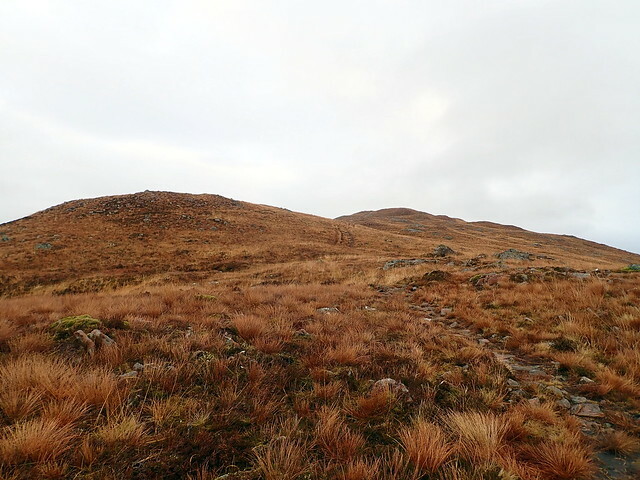 Accordingly I had a think about close-ish easy Corbetts - Beinn a'Chrulaiste came to mind immediately and I reckoned she'd manage that without much difficulty. 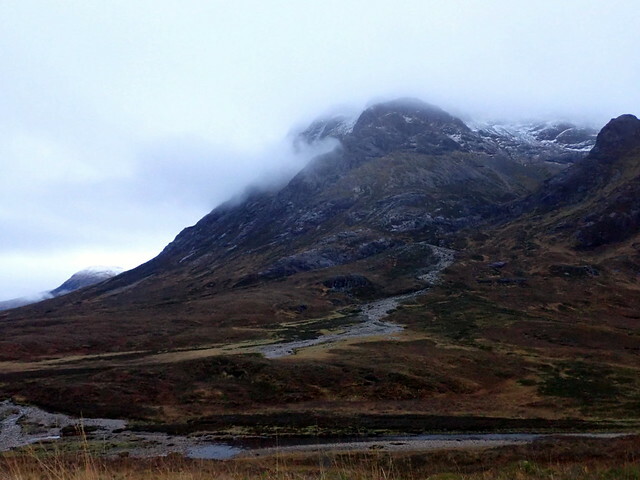 So I picked her up at 8 on Saturday morning and set off for Glencoe. It's ages since we've left on a Saturday - normally it's away on Thursday evening. The roads were quiet and we got to the parking place just before 10. A lot of cars across the road, people climbing the Buachaille, we imagined. Knowing that Beinn a'Chrulaiste is a perfect vantage point for the Buachaille was part of the attraction - last time we'd been here we saw nothing but teeming rain. So a view would be most welcome. 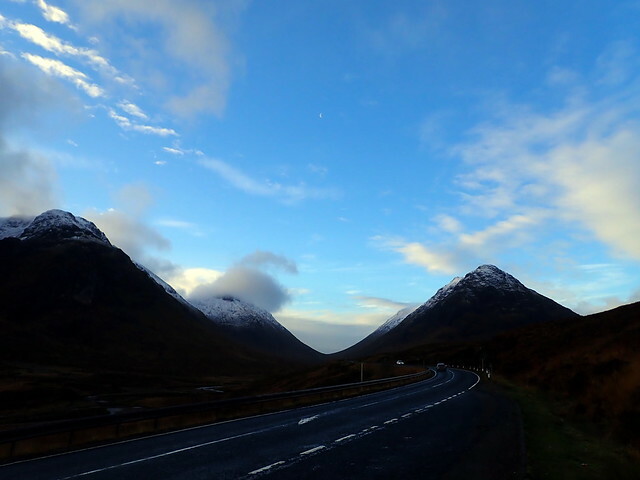 Glencoe was basking under blue sky, with some white cloud on the tops of the higher hills. 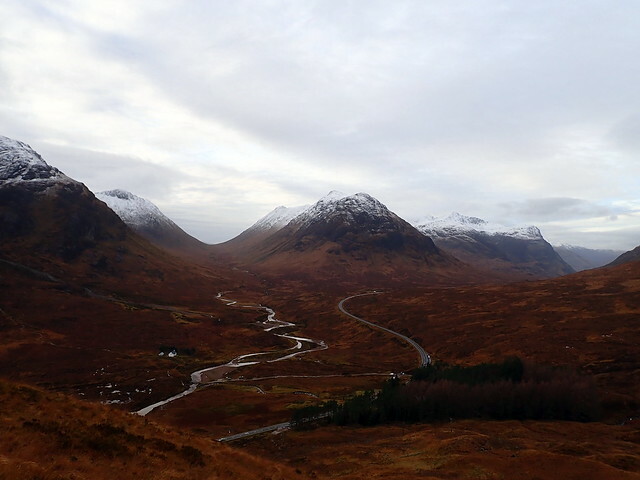 As we clambered up the soggy lower slopes of Stob Beinn a'Chrulaiste we watched the twin ribbons of the A82 and the River Coupall wend along the dun-coloured valley, with the mountains arising like stumpy, snow capped teeth. 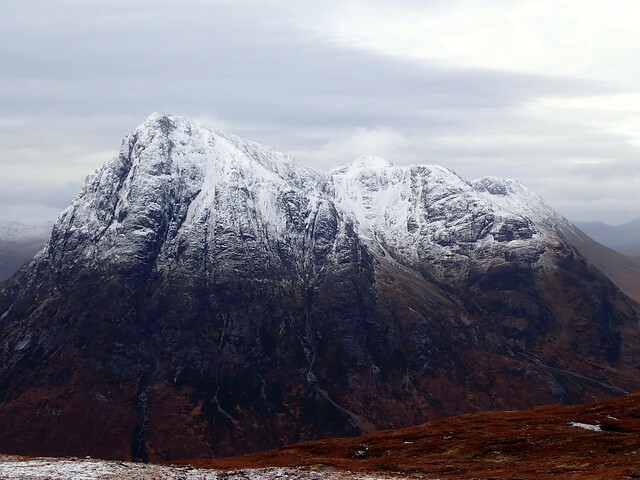 It's impossible to climb Beinn a'Chrulaiste without your view being taken over by the majesty of the mountain across the road. 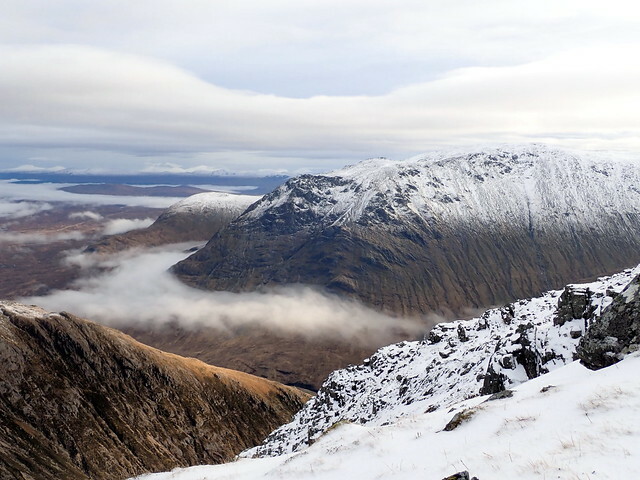 The profile of Stob Dearg, with Great Gully, the grand buttresses, Crowberry Tower, just imposes itself upon your consciousness like it or not. And what is there not to like. A truly iconic mountain, arising from the plains, rearing its great head. You'll perhaps forgive the multiple photos in this report. 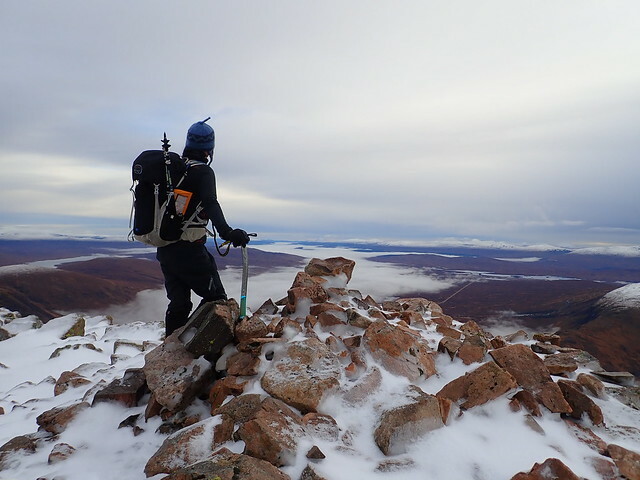 We arrived at the summit of a'Chrulaiste, where a few folk were already sitting enjoying the view, and decided on an early lunch to take in the scenery. Little wisps of cloud crossed the stern face across from us, sunlight came and went bringing different clefts into view; patterns in the sky altered, my camera kept on clicking. Allison seemed to be enjoying herself and showing little sign of her recent malaise. After we'd supped long on the views, we started to head down. 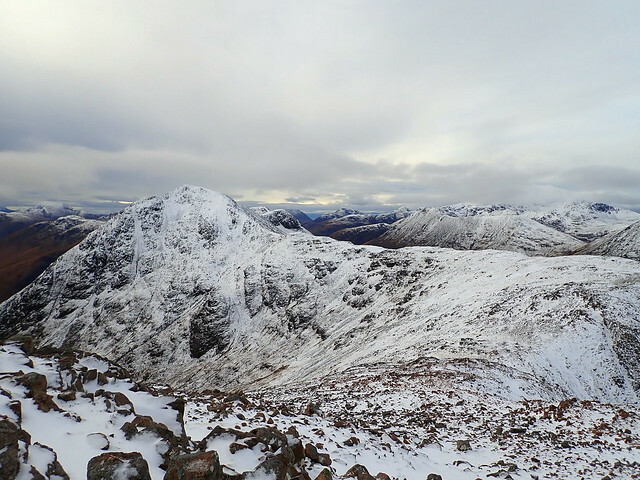 It was early yet, not even 2pm, and I decided I'd head round to the Devil's Staircase and nip up the two Simms that sit, one either side of the highest point of the path - Beinn Bheag to the east, Stob Mhic Mhartuin to the west. Given the choice of coming along or sitting in the car, Allison felt well enough to keep me company. We trotted up the Staircase, passed by what appeared to be a walking group on their way down. 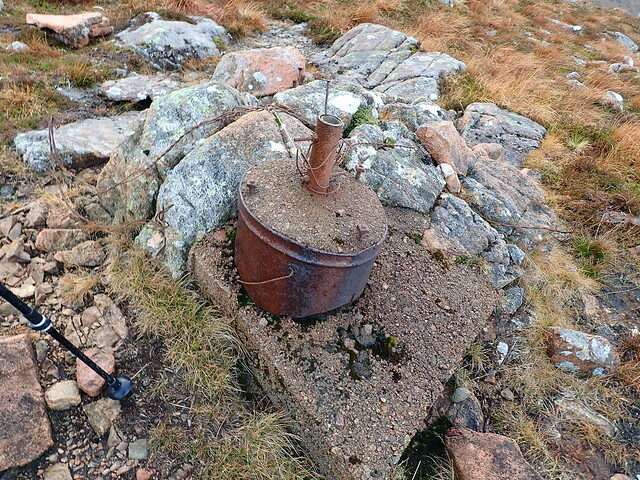 At the top of Beinn Bheag we found an old bucket, full of cement with a pole sticking out of it sitting in a block of cement. As you do. By the time we crossed over to climb Stob Mhic Mhartuin the weather had closed in, views retreated behind clag and a light rain started. We made our way back down to the car. 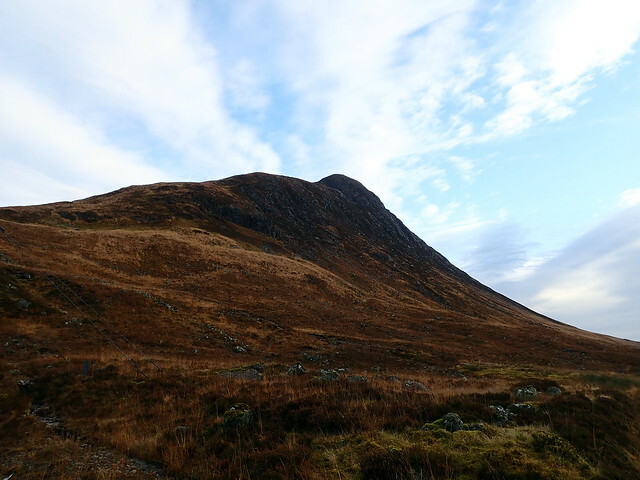 So far Allison was showing no signs of a relapse - I hadn't decided what we might do on Sunday, but since we'd spent so much of today looking at a certain mountain, I suggested we consider going up the Buachaille, to which she gamely said she'd give it a shot. We pitched the tent on some flat grass at Altnafeadh and spent some time reading before it was time for tea. One by one, the walkers' cars left and although there was some noise from the nearby A82 it wasn't a bad place to camp. Around 8pm we heard noises, French voices and the sound of folk pitching a tent, very close to ours. To be fair, there were few options, as we'd had a good scout around earlier. Being something of a Francophile, I rather enjoyed the Gallic cadences and they made not a sound overnight. 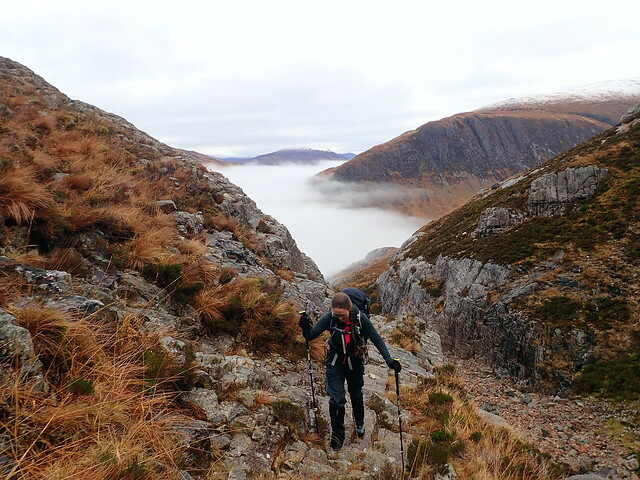 I thought they were maybe going to climb the Buachaille in the morning, but no, when I spoke with them, they were completing the West Highland Way. They must have had a pretty rough time of it earlier in the week. 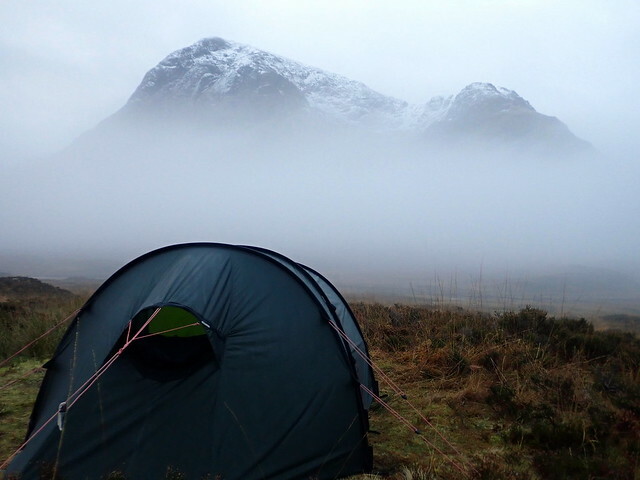 When I'd looked out from the tent at 7.30 all I could see was milky white air. I could just about make out the car parked 15 feet away. This caused me to retreat under the covers for another half hour. When we finally roused ourselves, the mist was clearing a little. 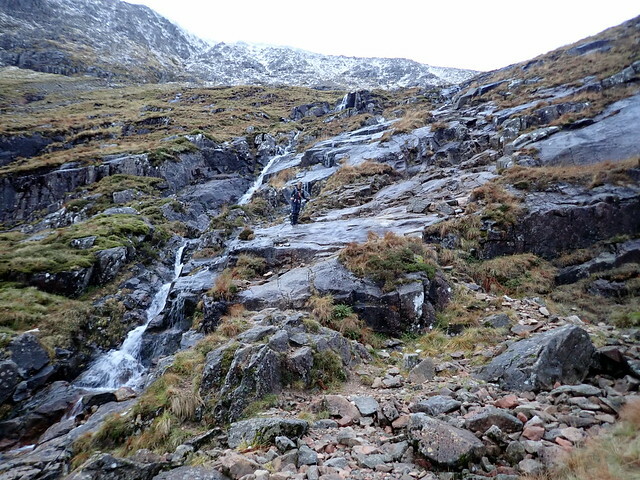 We packed up and set off at 9am, choosing the route up Coire na Tulaich rather than curved ridge today. 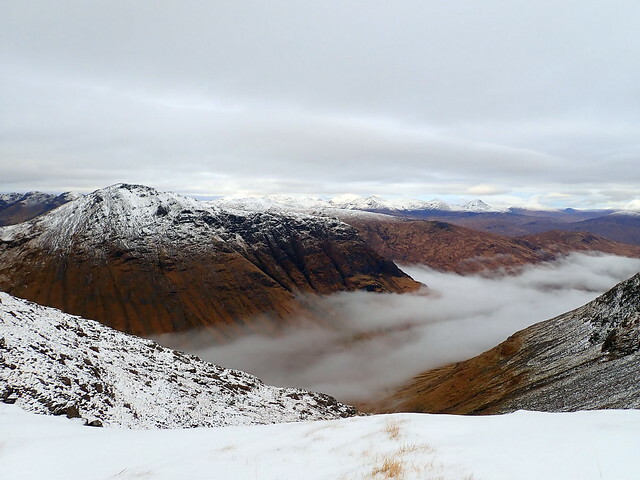 As we climbed, we left the mist below us and saw a fine inversion wending its way along the valley. 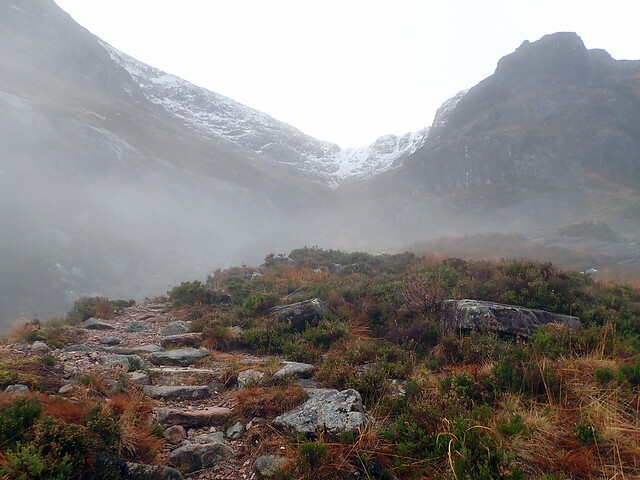 We followed the main path up into the coire then followed yesterday's footsteps heading up a narrow gully. It was increasingly steep and the walls closed in. 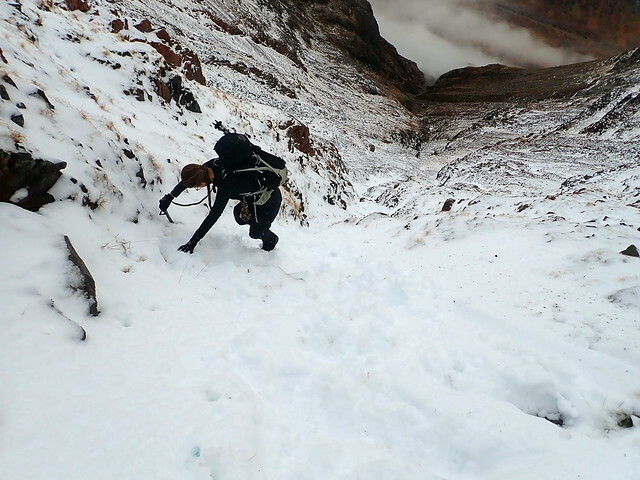 I led, kicking steps in the softish snow until I neared a rocky fang that would need negotiating. Under the fang was a cleft - only a few feet deep, but I became uncomfortable at the thought I might be standing on a deeper cleft. Deciding I didn't want to plummet into a snowy crack, I downclimbed to where Allison was and we decided to descend a bit and head out of the gully over to our right, where the path ascends (when not covered in snow). 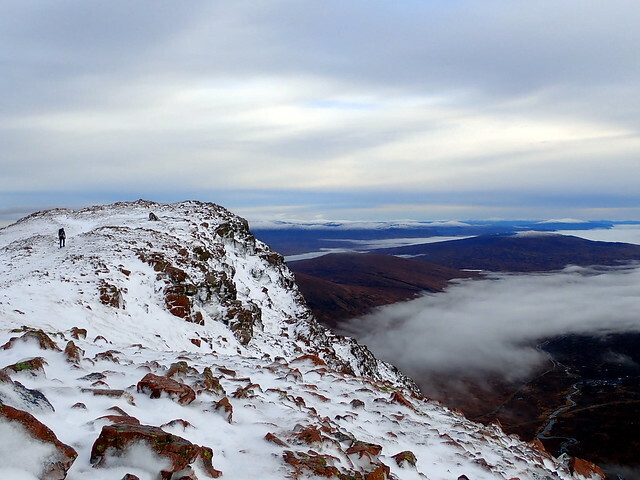 After a few tricky moves on unconsolidated snow and rock patches, we were at the bealach. 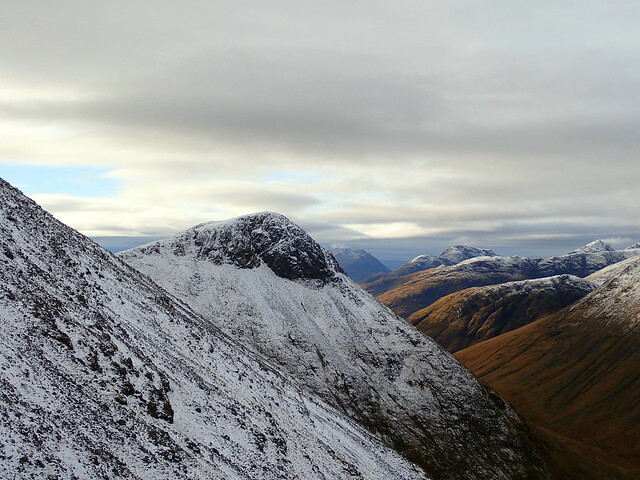 There was little snow on Stob Dearg itself. 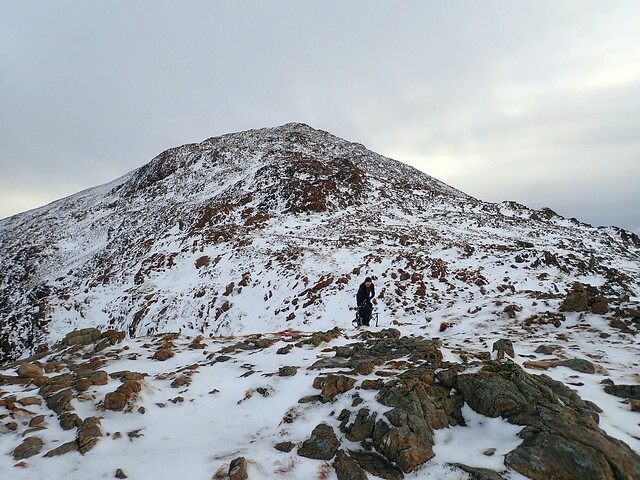 Many of yesterday's walkers had been wearing crampons, which suggested that despite what had seemed a cold night in our tent, there had been some thawing on the hillside. 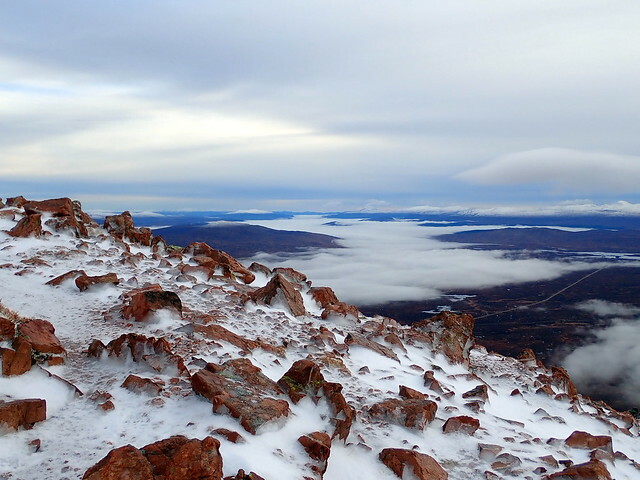 We eventually got to the summit of Stob Dearg, after a succession of false tops and gazed out at the inversion right over Rannoch Moor, stretching all the way to Schiehallion. Normally there's a raven up here that asks for food, but there was no sign of him today. 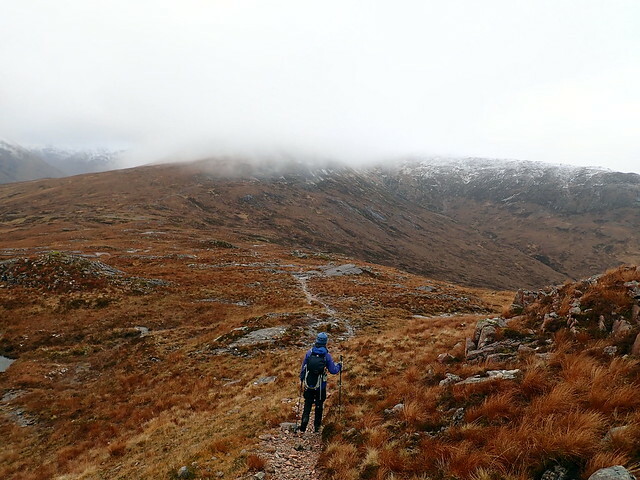 We turned around and made our way back to the bealach, ready to climb the impressive peak of Stob na Doire. 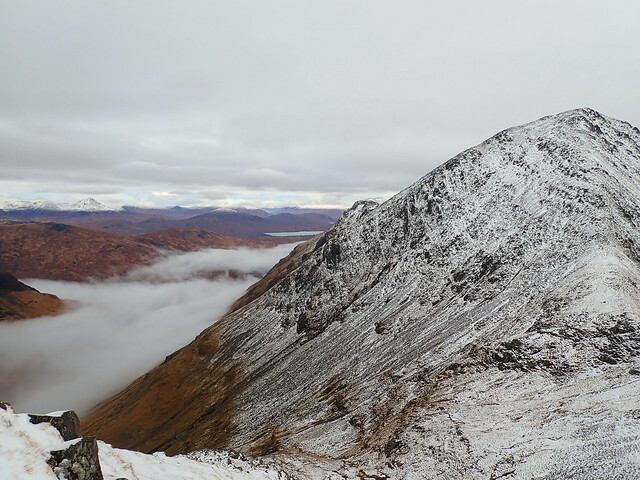 Why that summit isn't the second Munro rather than the comparatively diminutive Stob na Broige is perplexing - Stob na Doire is only 11m shorter than Stob Dearg and almost 60m higher than Stob na Broige, with a greater drop too (143m vs 134m). 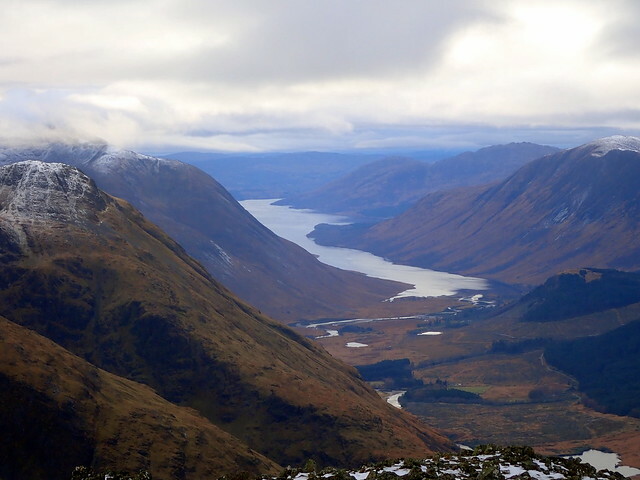 Anyway, it's not, so we had to climb over it on our way to Stob na Broige, which does have better views to Loch Etive, admittedly. 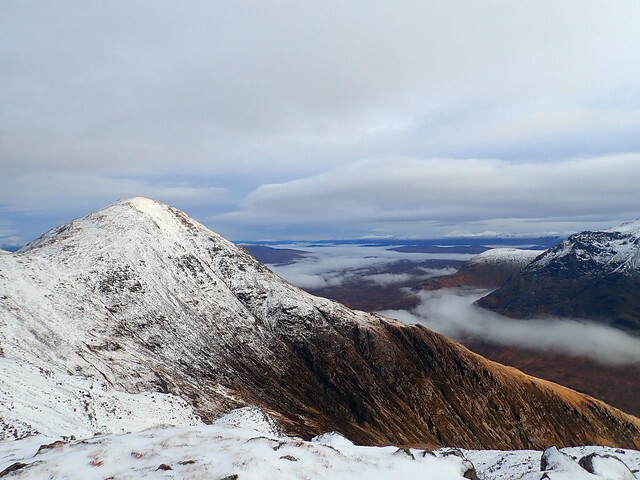 Looking back to Stob Dearg we got the last of the sun, as a grey ceiling of cloud began to descend on the surrounding tops. 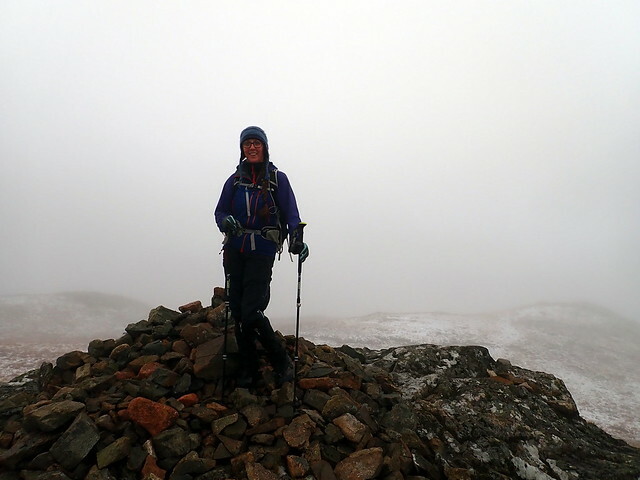 We made it to Stob na Broige just as the first wisps of mist were congregating around the summit - on the walk down to the Lairaig Gartain the cloud dropped further. 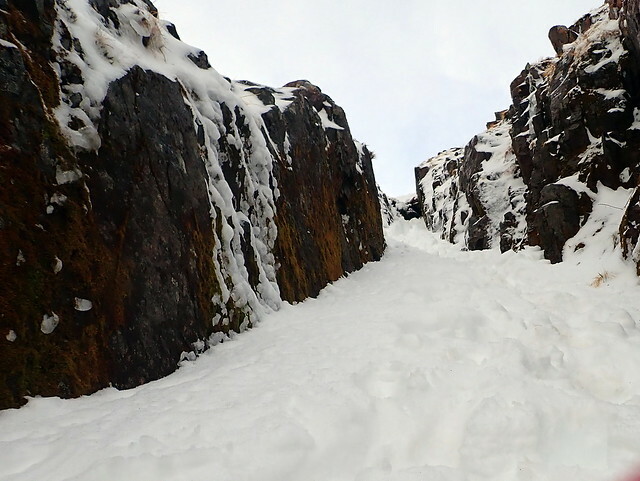 We were glad that the temperature was relatively mild as the section coming down slabs by the Allt Coire Altruim would have been quite challenging on glazed icy rock. We made it back to the car just shy of 4pm, with the twilight and mist combining to begin to conceal our mountain for the night. 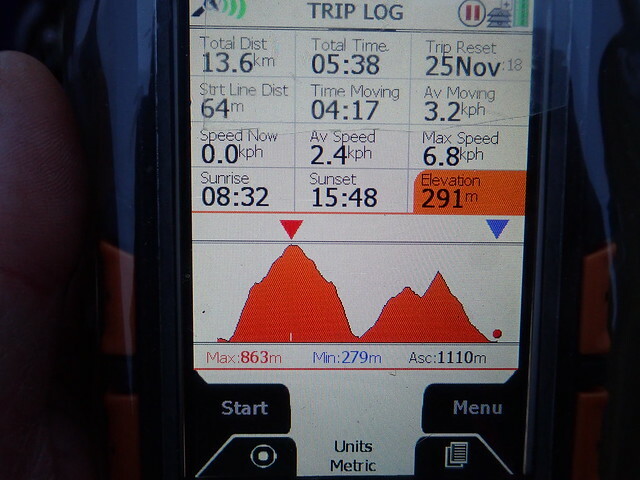 I was surprised to see that the distances and ascent for the two days was very similar, although it felt much more energy sapping today than on Saturday. 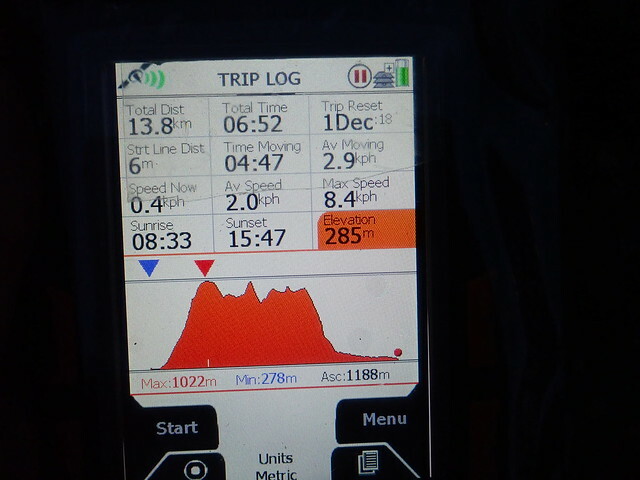 A miserably wet drive down the road after two better than expected days on the hills. 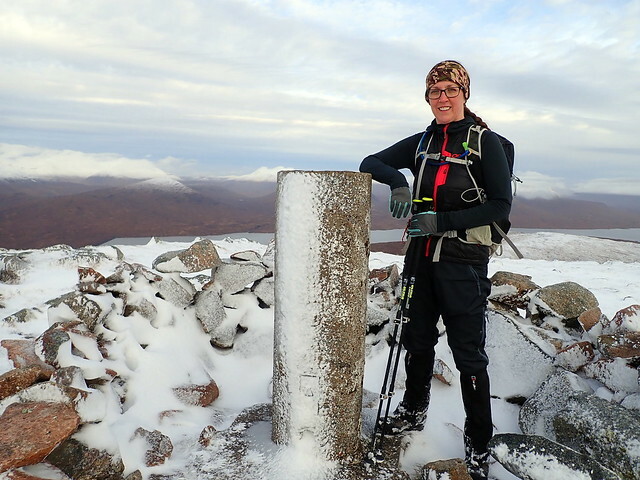 Allison wasn't feeling so hot as we drove home - perhaps The Buachaille hadn't been such a good choice of mountain for a recuperative hillwalk after all. 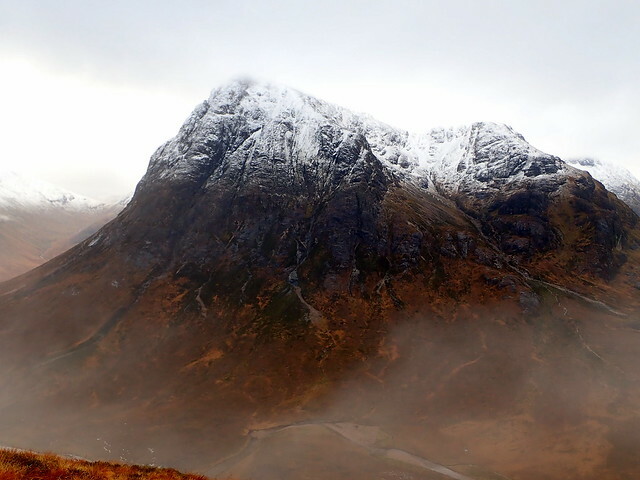 You've got some lovely pics of Stob Dearg there Al, looks a lot chillier up the mountains of Glencoe than when I was there just 3 weeks ago! 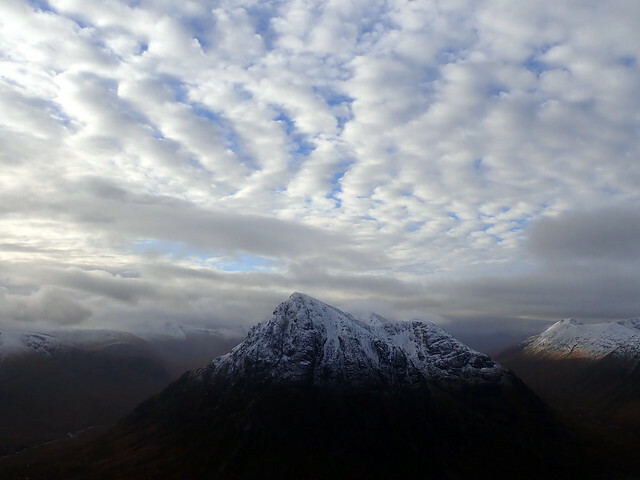 Your report has inspired Iain and I to get up Beinn a' Chrulaiste on a nice winter's day with our camera's so we can take advantage of such a great viewpoint, nice onet! 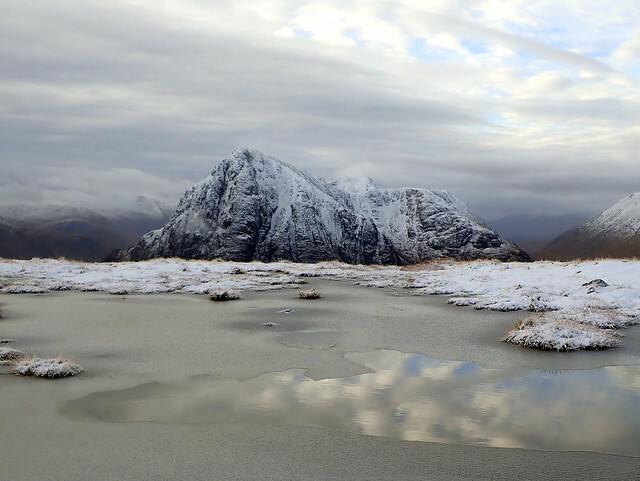 Your photo of BEM with frozen water in the foreground is superb. It's a great view from that Corbett. BEM is high on my repeat list for once I compleat. Winter is finally here! Cold and frosty, it makes for great photos even on grey days. 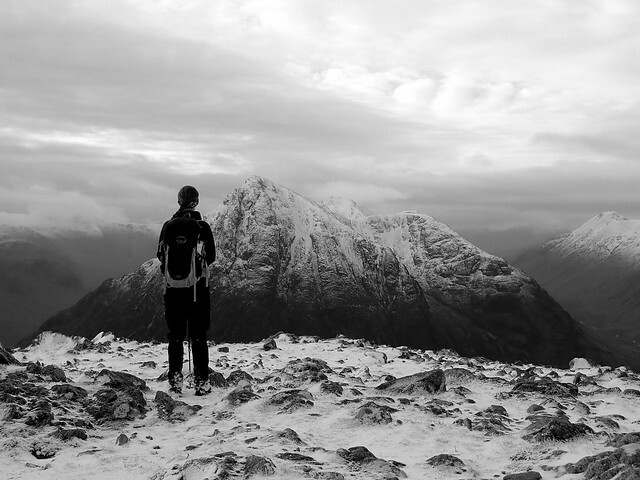 I'd love to repeat some of Glencoe hills in winter conditions (BEB to start with). 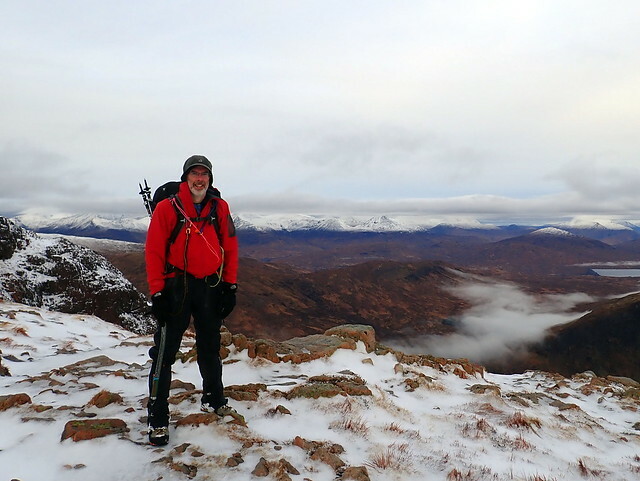 We were on the Cairngorms plateau on Saturday and my hands nearly fell off. Snow quite deep in places, I didn't expect that much! Fingers crossed, we will have white Xmas this year. 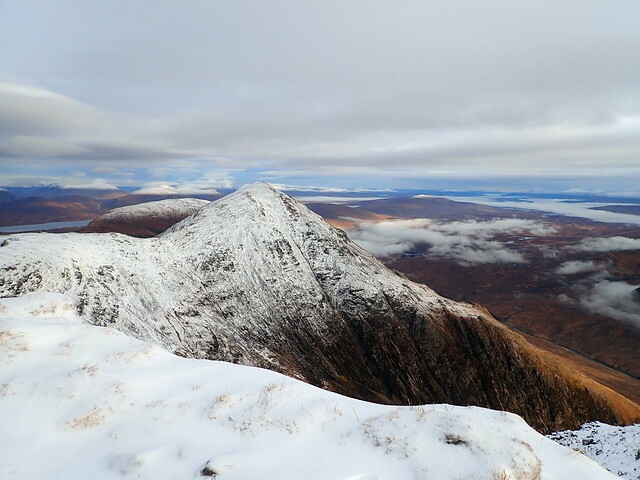 Chris Mac wrote: You've got some lovely pics of Stob Dearg there Al, looks a lot chillier up the mountains of Glencoe than when I was there just 3 weeks ago! 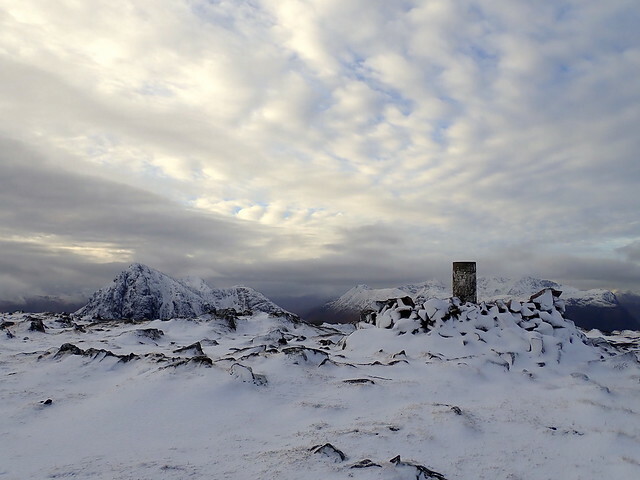 Your report has inspired Iain and I to get up Beinn a' Chrulaiste on a nice winter's day with our camera's so we can take advantage of such a great viewpoint, nice onet! That's a superb sequence of landscape pics - must have been so much more dramatic in the flesh! Quite impressed you managed to sleep near the A82 - that's a pretty busy road! Do you use earplugs? Alteknacker wrote: That's a superb sequence of landscape pics - must have been so much more dramatic in the flesh!